Homes in Solana Beach tend to be treasures–and in high demand. And what’s not to love? Homes in Solana Beach have so much to offer. 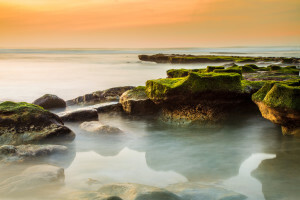 Beautiful beaches are nearby (including Fletcher Cove and the ever-popular Dog Beach), as is Del Mar, the Del Mar Racetrack and Fairgrounds to the south with Rancho Santa Fe to the east with Cardiff-by-the-Sea to the north. The population of Solana Beach is relatively small at around 12,000. The “downtown” area around the Cedros Design District has more than 85 art galleries, antique stores, specialty boutiques and cafes. We are especially fond of the Design District and its Solana Beach Farmer’s Market held every Sunday from 1 to 5 p.m.–as well as the Belly Up Tavern and its live music productions. Remarkable opportunity to own a coastal investment property, second home or beach escape. Ideal ocean bluff location, close to it all... Beautiful beaches, shops, dining, the Del Mar Racetrack & Cedros Design District. Seascape Sur offers a gated community w/ secure parking garage, lush landscaping, koi ponds & oceanfront walking paths. Two pools/spas, tennis courts and clubhouse. This rare tower end-unit features expansive ocean views, two master bedroom options w/add'l room & large deck. This is a deal! The Residences at Solana Beach is a collection of new, luxury homes in a premier location west of I-5 and in walking distance to new elementary and middle schools, Cedros Design Center, and La Colonia Park. Complete with modern finishes, the open floor plans allow seamless indoor/outdoor living with panoramic doors opening to private balconies. The backyards are perfect for entertaining and a community terrace features fire pits and lounge areas. Units boast 2-car garages, fireplace and office nook. Charming coastal cottage, updated & ready for occupancy! Fabulous .36 acre lot, w/ huge rear yard, specimen palms & outdoor shower. Darling detached studio ideal for those extended stays. Main house offers 3 BR, 2 BA & 1507 SF. Lovely hardwood floors throughout, inviting fireplace in LR, & French doors to spacious bricked patio. Endless expansion opportunities as City of Solana Beach will allow up to 4,635 SF. A short stroll to cafes, hiking trails, beaches & neighborhood schools. A rare find indeed!! STUNNING **BRAND NEW CONSTRUCTION **California Coastal Mediterranean Estate thoughtfully designed to maximize the relaxed surf and sand lifestyle. Sit down ocean views from every level. This home features an open floor plan with living areas that extend beyond space and functionality. Take advantage of indoor/outdoor entertaining -enjoy majestic views of Solana beach Coastline, Ocean breezes and Magnificent Sunsets! Wonderfully located, stones throw away from Cedros Design District, beaches and dining. Excellent location unique single level home offered for the first time since it was built in 1973. Master bedroom is enhanced by open wood beam ceilings, with doors to deck, facing west for great sunsets. Entire home has tile floors, custom cabinets and granite counter tops. Custom range in kitchen with an island counter opens to a breakfast area. Master bedroom is on opposite side of home from the other 3 bedrooms. A host of amenities contribute to the unique character of this home. Based on information from California Regional Multiple Listing Service, Inc. as of April 20, 2019 06:58 and/or other sources. All data, including all measurements and calculations of area, is obtained from various sources and has not been, and will not be, verified by broker or MLS. All information should be independently reviewed and verified for accuracy. Properties may or may not be listed by the office/agent presenting the information.